Previously, MySNU was only accessible through web browsers such as Chrome and Safari, and school services such as the SNU menu and the online SCARD required users to download separate apps for each function. The new app eliminates the need to have separate widgets for each service. Services provided by the SNU administration are also featured on the app. Course registration for both regular semesters and summer/winter semesters, class cancellation, application for a leave of absence, and request to change majors are all possible. 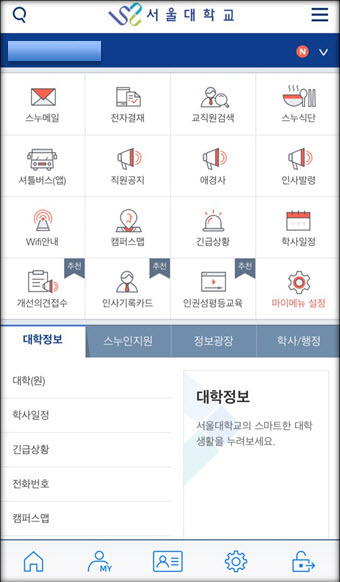 The MySNU app also allows one to apply to become a Teacher’s Assistant and to book appointments for medical examinations at the SNU Health Clinic. Other functions include the campus map and the academic schedule, indicating school-wide off-days and national holidays. Users of the app also have the option to receive customized school announcements as push notifications.